"I have a dream that one day every valley shall be exalted, every hill and mountain shall be made low, the rough places will be made plain, and the crooked places will be made straight." "From Dallas, Texas, the flash - apparently official - President Kennedy died at 1:00 p.m. Central standard time, 2 p.m. Eastern standard time, some thirty-eight minutes ago." Now, if veteran rabble-rousing, uber-networking, visionary ("Blacklisted") journalist Al Aronowitz's lifetime of achievements may be remembered for but one solitary event, may I posit it be for what he managed to pull off in the immediate hours following The Beatles' concert debut at Forest Hills Tennis Stadium, Queens, New York, one dreamy midsummer 1964's night. For it was within mere minutes after the final shrieks of and around "Long Tall Sally" wafted skyward that our story begins, with the Fab Four safely ensconced back upon the sixth floor of Manhattan's grande olde Hotel Delmonico as a greenroom full of various folkies and followers (including the Kingston Trio, Peter Paul and Mary, plus the ubiquitous Murray the K) sat all but ignored down the hall. Somehow though, into that inner sanctum high atop the Beatle-manic corner of Park and 59th was snuck none other than Bob Dylan, a bottle of cheap wine, and a fateful envelope's worth of herbal libation. You see it seems Bob, misreading a certain "I Want To Hold Your Hand" refrain as "I get high" as opposed to "I can't hide," had been convinced to confront those four lyrical Liverpudlians he'd previously dismissed with that cruelest of epithets -- "Bubblegum!" -- and in the process, to break the trans-oceanic ice as it were, he decided to introduce his fabulous new pals to the hitherto non-rockin' accoutrement known as, yep, Marijuana. Suffice to say it wasn't just the Cute Beatle's consciousness which was forever altered that night, but the very course of rock and roll, the music business as a whole soon enough after, and as a result just maybe Western Civilization Itself, dammit! And it is in my wisened opinion that the singular man we all have to thank for that, for "Rubber Soul," for "folk-rock" in the process and, really, for loading Dylan into his station wagon and dragging him towards the Delmonico to set all of these historic balls into motion in the first place, is none other than a dear, sweet man I've recently had the pleasure to have known named Al Aronowitz. FACT: With all apologies due Ralph J. Gleason, Al Aronowitz was the first widely-published man to ever take what we now regrettably take for granted as rock and roll "seriously." His Pop Scene columns four decades ago in the New York Post, not to mention a litany of legendary Village Voice and Saturday Evening Post features, brought to widespread attention such figures as the fledgling Brill Building songsmiths, teen tycoon Phil Spector, and of course Bob and those Beatles to boot (i.e. : the best-selling Aronowitz Summer of 64 Saturday Evening Post cover story of JPG&R I still fondly recall as the first living-color magazine on the band to ever penetrate my previously rock-free household --because the boys looked so handsome in their top-hats and walking sticks on the cover, I can still hear my mother swoon). Even prior to that above-mentioned hot August night at the Delmonico though, Al was busy forging crucial artistic bridges between hitherto insurmountable cliques and cultural divides. 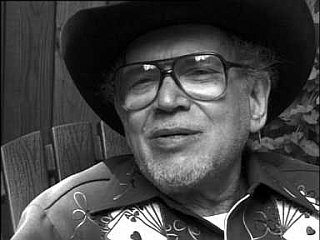 To cite but one cataclysmic example, it is SO plain to see how Al's introducing Allen Ginsberg to a fresh-from-Minnesota Dylan eventually helped Beat meet Beatles, as it were, and in all the most ingeniously genre-busting of ways. Aronowitz was also right there on hand at the post-premiere party for "A Hard Day's Night" in London, as a wickedly soused Lennon motioned a very young, green Keith Richard(s) and Brian Jones over to his table --only to conspiratorially sneer that "there's something wrong with yez, isn't there? There's one of ya in the group that isn't as good as the others. Who is it? Find out, tell yourselves, and get rid uv 'im." Keith glanced uneasily over at Brian. John, as it turns out, was as right -- not to mention prescient -- as ever. Then suddenly our hero seemed to vanish altogether off the very face of the Earth -- not to mention the pages of rock's hepper periodicals -- as "folk" sorrowfully gave way to "singer/songwriter," Nixon rued the airwaves, Patrick Sky accepted a grant from the Irish government to become an Aeolian pipe maker and, perhaps not so coincidentally, Al's old pal Bob dissolved altogether into the bit parts of big-budget Peckinpah westerns. But why? "I was driven crazy by my unjust firing from the Post when my column was one of the most popular features in the paper," Aronowitz recalls, "by the treachery of the American Newspaper Guild and by my colleagues whom I had helped so much." The death of his wife and subsequent plunge into the clutches of non-recreational drug use followed and, he says today, "so began a long period of time when editors stopped taking me seriously, a fact that continues until this day. In other words, my writing got a little crazy and even when it wasn't, editors still refused to print me. Why? Ask THEM!" Then, thank God or Al Gore or whomsoever, along came the Internet at just about the same time Our Al was getting his life, not to mention his voluminous-and-then-some archives, back in order. Duly invigorated and in no small part inspired by the liberating autonomy of the www, Aronowitz was promptly reborn as The Blacklisted Journalist and, domain name duly secured, began posting his vast wealth of work in monthly installments right up there at www.bigmagic.com/pages/blackj. "It was only when I could do an end run around the blacklisting that editors had imposed on me by putting my material on the Internet that I discovered I could get readers, something all writers crave," the man proudly relates. "It was my achievement of a reading audience that brought me back to sanity." Today, after a decade spent defiantly republishing his gems on the web, when he was afraid his good words would otherwise languish unread or, worse still, disappear altogether (it was through a tiny backpage ad in the New York Press circa 1996 that I first became reacquainted with that entity henceforth known as The Blacklisted Journalist), Al has now compiled his Greatest Hits, so to speak, across the 615 history-packed pages of "Bob Dylan and The Beatles: Volume One of The Best of the Blacklisted Journalist." The result is, without a solitary doubt, Required Reading for anyone and everyone who considers themselves fans, followers, students, or those just plain curious of the Golden Age of Popular Music, and how the players -- Dylan and the Fabs especially -- met, influenced, and eventually actually interacted with one another during those halcyon-indeed daze. Thanks in no small part whatsoever to the Herculean efforts of the man who, in his very own only slightly jocular words, may try to pass it all off by claiming "I was just a proud and happy shadchen, a Jewish matchmaker, dancing at the princely wedding I arranged." 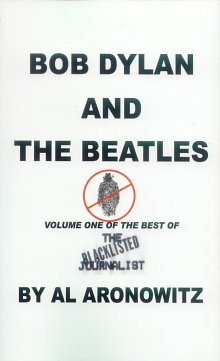 "I recognized Dylan and The Beatles as immortals, and I wanted to cop some immortality for myself," Aronowitz now admits. "I knew that bringing Dylan and The Beatles together would have exactly the result that it had. The result is that contemporary popular music changed for the better. Otherwise, every generation creates its own heroes." Oh, and by the way, if the gala Bowery Poetry Club launch party for "Volume One of The Best of the Blacklisted Journalist" is any indication whatsoever, the master shadchen's talents are alive and very very well: Entertainment was provided by a band comprised of David Amram's wholly Kerouac-worthy "spontaneous bop prose" backed by Hayes Greenfield's Coltrane'd sax and, to top it all with that classic decorum-be-darned Aronowitz touch, Babukishan Das, the Bengali Baul who's become one bonafide Indian pop star. The ears truly boggled! and tell 'em Gary the Pig sentcha, ok?